The Income-Tax department has already started an inquiry into the recovery. Police in Patna on Tuesday arrested a man who had allegedly burgled the home of BJP MP Giriraj Singh a day earlier. But in the process, the police appeared to have caused both the MP and his party significant, if unintended, discomfort. The alleged burglar, a man called Dinesh Kumar, was caught with a suitcase packed with Rs 1.14 crore in cash, 600 US dollars, two gold chains, a pair of gold earrings, a gold locket, three gold rings, 14 silver coins, and seven luxury watches — all of which he said he had stolen from Singh’s home on Boring Road in west Patna. However, while reporting the theft to the police on Monday, Singh is believed to have mentioned only a small fraction of this sum and “some jewellery” as having been stolen. Till late on Tuesday night, neither the MP nor any member of his family had shown up before the police to claim the cash and valuables. The MP’s phone was switched off. While the state BJP argued that it must not be assumed that the cash and valuables belonged to Singh until he said so himself, Vijay Kumar Choudhary, a senior minister in the Bihar government, said that the case would be investigated with a view to establishing the “real owner of the cash”. The Income-Tax department has already started an inquiry into the recovery. “It is up to the police to investigate and find the owner or owners of the recovered goods,” BJP state president Mangal Pandey told The Indian Express. 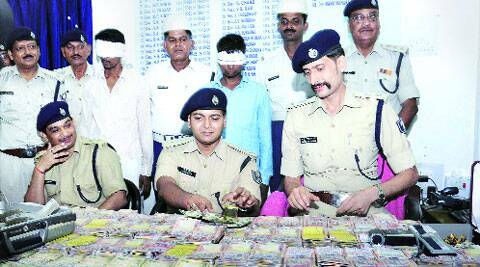 “Giriraj Singh had talked about the theft of only Rs 50,000 and some jewellery. Police should not believe what the thief says, but probe deeper. If the owner is not claiming the stolen goods, there is no reason why it should be assumed that they belong to him,” Pandey said. Giriraj Singh is the BJP MP from Nawada. He is the same man who in an election speech at Deogarh in Jharkhand on April 18 said that those opposing Narendra Modi had no place in India, and should go to Pakistan. Singh, who was an MLC before being elected to the Lok Sabha, had declared an election expenditure of Rs 27 lakh. As per Bihar government figures from January 2013, his assets at the time totalled about Rs 75 lakh, which included the market value of his properties in Patna and Begusarai. Singh was animal husbandry minister in then Chief Minister Nitish Kumar’s NDA government until the JD(U) split with the BJP in June 2013. He had always been a vocal supporter of Narendra Modi. Patna Senior Superintendent of Police Manu Maharaj said: “Though the MP had not mentioned that this much amount was stolen from his house, the arrested thief Dinesh said the money and goods were stolen from the MP’s house”. The SSP said Dinesh had committed the theft in connivance with the MP’s bodyguard Rupkamal, guard Dhirendra, and domestic help Lakshman. “They had planned the theft 15 days ago,” he said. All three alleged accomplices have been arrested as well. According to Maharaj, Dinesh, who has several cases of theft against him, had promised the other three a “good share” of the booty. He was picked up after police spotted him travelling in a vehicle “in a suspicious manner, tightly holding a suitcase”. “He was probably going to hide the stolen money somewhere,” Maharaj said.